The living room is a perfect place where you can entertain your friends. To create the necessary ambiance, a complete makeover is necessary. A makeover is also necessary when you want to keep calm and feel relaxed this summer. Here are some exciting summer makeover ideas for your living room. Summer is a sunny, hot and bright weather. Therefore, considering some fresh colors that can cool down the heat is a good idea. However, for your living room ensure that you go for the welcoming, rich and warmer colors. A good color choice for living room during summer is a perfect combination that lifts up the mood of the entire room creating that “want to be at home” feeling. Most importantly, when choosing the colors for your summer living room makeover focuses on giving your home that dazzling appearance. The summer color choice should create that cool effect and worth spending your cash on. Practicality, functionality and decorative are the key factors to consider when upgrading the curtains. Consider that the living room is the most lived in the room during summer. In that regard, these factors need to take the center stage when selecting the best summer curtains for the living room. When choosing the summer curtains consider how big the windows are, and relate to the king size adjustable bed of the living room. Consider that simple and extra long curtains hanging to the ceiling height are best for making small living room appear larger. In summer, a thick fabric will trap the heat and so you need to go for the lighter material to make the living room habitable during the hotter days. Pick the sheer curtains that allow a cool breeze into the living room and allows natural light into the living room. Replace the original couch cushions with different colored cushions to create a different look and feel. 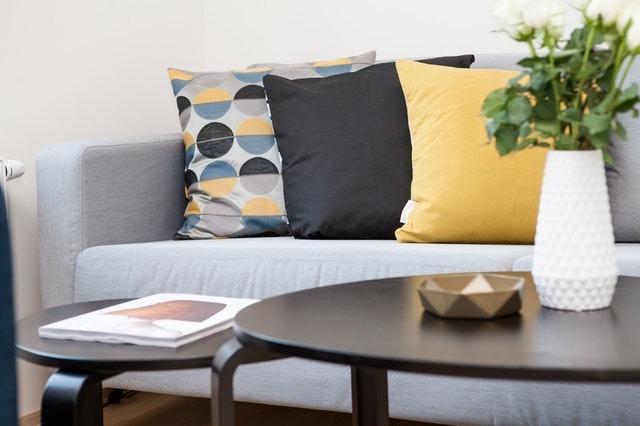 The advantage of adding cushions in your living room is that it is an opportunity to add a different color and texture that best suits the season. Add cushions that will compliment the other colors in your living room. This can be the color of your living room furniture, the curtains or even the living room walls and artwork. The bold colored cushions that come with geometric or abstract patterns are also a great idea. Add that summer radiance to your living room with best summer wallpapers. Wallpapers are available in different colors, texture, and help to bring out a perfect theme that matches the season. The advantage of wallpapers is that they are easy to put on and so you can give your living home a complete makeover within a fortnight. For the best look choose the wallpapers that feature a bright vibrant color. You can also opt to add that summer natural look by putting up green summer wallpaper. 6. Bring in Eco-Friendly Stuff! Summer is more about outdoors and so for a perfect feeling this summer, you can choose to bring some outdoor life indoors. To accomplish this you can make DIY flower vessels and place those beautiful summer flowers in your home. Those are the exciting living room makeover ideas to try this summer. Queen headboard with frame can be a great thought as well. Remember that the summer season is more of playing it cool and creating a calm feeling.